Go to the driving range to find out how far you hit each club in your bag. 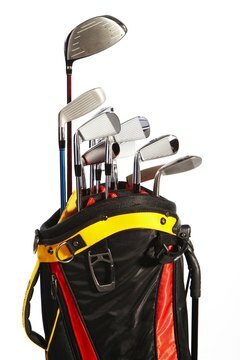 USGA rules allow the golfer to carry 14 clubs. For beginners, selecting the right club from this collection can be intimidating. There are some general guidelines that you can follow, although your experience may tell you to try something different. Even the pros sometimes have to take an educated guess when choosing between clubs and hope for the best. To find out how far you hit each club in your bag, go to a driving range that has flags to mark the distance. A set of clubs typically includes a driver, a couple of fairway woods, irons, a pitching wedge and a sand wedge. Specific clubs are designed for different situations. The driver, or the 1 wood, has a very low loft compared to other clubs and is designed for when you need to achieve long distance off the tee. Fairway woods can allow you to hit for distance, while the higher lofted irons and wedges are used around the green. Hybrid technology has produced easy-to-hit clubs to replace the longer irons, or even some fairway woods. The putter is used on or just off the green if the grass is cut close. Higher numbered clubs will have a higher loft and produce a shorter shot. In order to choose the correct club, you need to take factors into consideration other than distance from the ball to the pin. If you notice a hazard or obstacle on your target line, you may decide to “lay up” and hit short to avoid trouble. If the green is elevated, you may need to take a club that provides more distance than the club you would typically use. On a day when you are fighting wind, or if you are in deep rough, you may have to use a stronger club. Drivers are designed to go a great distance, but for the beginner the long shaft and low loft can be hard to handle. Some beginners find more control using the 3 wood off the tee. If you do use a driver, as a beginner you might want to try a club with a large clubface for a larger sweet spot. The loft angle should be from 10.5 degrees to 12 degrees or higher to help launch the ball into the air. New golfers should use a more flexible shaft. Experienced golfers can use a 3 wood and 5 wood from the fairway for distance, while high handicappers may have to stick to more lofted woods like the 7 wood, or even the 9 wood that do not provide as much distance but are easier to hit. The more lofted irons such as the 6, 7, 8 and 9 irons are easier to hit for the high handicap golfer. These clubs can be used as you get closer to the green for pitch shots and chip shots. In general, the higher the loft of the club, the higher the trajectory of the ball, and the less roll you will get when the ball hits the ground. More experienced golfers may be able to handle the 3, 4 and 5 irons, which provide more distance because of the lower loft. The pitching wedge is used close to the green, and the sand wedge is used out of a bunker near the green. A lob or gap wedge will provide a high trajectory to hit up and over a sand trap or other hazard near the green. Some golfers are now replacing the longer irons with hybrids or “utility clubs” to achieve distance and accuracy in the fairway. For the high handicap golfer, a 3 and 5 hybrid can replace the 3, 4 and even 5 iron. A hybrid places the weight to the back and bottom of the club, allowing for a higher launch angle. Hybrids have a higher spin rate to provide a softer landing with less roll, so the golfer will have more accuracy. The shaft of a hybrid is shorter than that of a fairway wood, making it easier to hit. Players can use hybrids in the fairway, to get out of the rough or even to hit out of a sand trap.